Do learners learn because of, or in spite of, the teacher? This was the question put to the #ELTchatters on Wednesday 5th December, in the second session of the day. What an interesting question- and did we find the answer? Not exactly! But we had lots of conversation around the subject. We also agreed that if the latter was the case we would all be in the market for a new job! The question came about after @pjgallantry noticed that some students made progress, regardless of bad teachers or unsuitable techniques, and wondered what the secret could be. @ljp agreed that it was , thankfully, true in some cases! @shaznosel took it a step further and asked what made some students much more effective learners than others. @cioccas thought that there was no answer and that because of and in spite of the teacher was a realistic way to look at what happens in a classroom. @naomishema thought that part of a teacher’s job was getting students to sit down and work and that even not very good teachers are able to do that. Could it be a question of motivation? @vmorgana asked how strongly motivation can influence language acquisition. @haniehak believed that the teacher provides persuasive motivation and helps the students to become autonomous learners. @TailormadeEng and @DRichW both agreed and said that it fit nicely with Krashen’s ideas about input. It was mentioned that motivation can come from both positive and negative sources, making students decide to succeed at all costs. @MoAmericanoid thought that teachers were in a strong position to add positive motivation to students. Do you ever feel that what your learners are learning doesn’t really require a teacher? Could students just teach themselves? @shaznosel offered us a link to info about Sugata Mitra’s ‘Hole in the Wall’ experiment http://t.co/8HibhOt4 which many of us had already heard of, and which, according to @theteacherjames, could have serious repercussions for us. It was agreed that students still need interaction to bring language to life, even though they can learn some things independently. 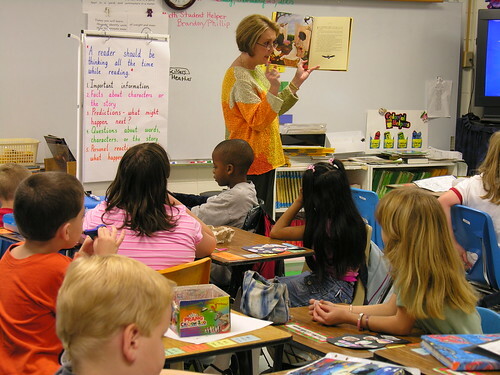 The classroom is the place where interaction happens; is the teacher necessary? Both feedback and interaction are needed. Matt agreed about this but said that his interest lay in developing learner autonomy and feedback and interaction between the students. @KerrCarolyn asked: How much of our job is to help SS become able to learn alone whenever they can? However, some students need guidance about how to learn. This was reiterated by @JoHart, who said: some students need help to develop independent learning skills and need scaffolding and guidance. Not everyone has the self-discipline to learn at home. The teacher is then necessary to motivate and guide the students. Teaching self-editing and self-evaluating skills increase confidence and allow them to become less dependent on the teacher. @theteacherjames suggested that our job is to create the conditions for learning; which some need more than others. @Sharonzspace: maybe we help with the emotional scaffolding that maximises learning. @TailormadeEng: teacher’s job could be to ensure exposure to language. Teacher has a major role as a facilitator. @naomishema: and part coach! JoHart: especially with adults as they are often less confident than the young. It was said that adults need coaching more than the children at school, as they have more demands on their time and need the discipline of having a teacher, set times for lessons, and someone with expectations from them. @SueAnnan suggested that teachers should demand more of the students than the students might of themselves, and are suitably placed in a classroom to do that. @MrChrisJWilson mentioned a study which showed that error correction had no noticeable effect, and James thought it would be interesting to compare the effect of teacher pointing out errors, against students being led to discover the errors for themselves. Teachers know how to adapt to circumstances and can be flexible enough to suit the learning needs of the students. @TailormadeEng: skilful teachers know when to switch between the almost endless roles we are required to inhabit. @theteacherjames had the last word here: ultimately, the work has to be done by the student, without that they’ll achieve nothing. Does the teacher have more or less of a role on online courses or f2f? This would appear to depend on whether the online course is synchronous or asynchronous. In the latter case, the teacher is automatically more distanced from the students. Perhaps the fact that so many courses exist online, yet students still book face-to-face courses, suggests that there are many people who still consider a teacher necessary. Have you ever had one of those students who never seem to do a thing in class, do little, if any homework, but still seem better other students? This situation was one with which many of us were familiar, as well as the alternative where students make no progress, regardless of the best attention of the teacher. These students upset the industrious, but less able, students in their classes. However, they do not generally continue to make progress at the same speed as those who engage and study, and ‘drop off’ when they reach a certain level. Naomi mentioned a student she is teaching who appears to have a natural aptitude for English, although the student is mentally challenged in other areas, and asks whether a ‘talent for languages’ could explain the apparent success some people have to learn languages easily. There are also the students who expect the learning to come from the teacher. The question was raised about whether this was a phenomenon more common to private schools, or even outside the system, when teachers are paid directly by their students. Do the students have the right to learn nothing and make no progress? The consensus was that they did have the right, but that it was unhelpful in a system where the teachers were graded on the development of their students. 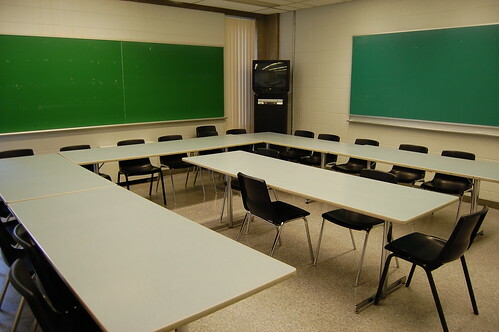 Are classrooms, in fact, effective learning spaces? This could depend on how flexible the teacher is allowed to be in class. @Cioccas mentioned a 1-2-1 student who didn’t cope well in the classroom, but blossomed under private tutelage. She was an exceptionally bright student who was hindered rather than helped by the group. Some students prefer to work in a 1-2-1 environment, and some are motivated enough to work alone. This caused a division in the group: those who prefer to have a teacher and those who don’t think it always necessary. Taking on ownership of, and responsibility for, one’s own progress may help develop independent learning skills, which is something worth considering. It was suggested that spoon-feeding answers raised a class of students who became over-reliant on the teacher; to a certain extent the ‘Foie Gras’ system referred to byCarolyn which she considered to be unhealthy. I, personally, have taught students who learned English by listening to pop music in the 1960s and ‘70s. They were able to use the language at intermediate level without any other input. So, is there anything that a student cannot learn without a teacher? As much of what we traditionally do in class can be found on the internet today, if students are self –motivated they will be able to do a great deal without a teacher, including working on pronunciation, which was always seen as the preserve of the teacher in the past! However, some people need more help. As Carolyn said: It’s like a driver without a map. You can drive but it takes longer to get somewhere without the directions. And some people need maps more than others! Another metaphor was the coach one- we kept returning to the coach idea during the discussion; Andy Murray can play tennis without his coach, but is better with his guidance. Lesley said that she was always striving for the moment when students are learning, and you realise you aren’t teaching. It is not something which can be planned, or forced in any way, but it is a magic moment. One hopes that it shared equally by the teacher and the studentJ Paulsuggested that ultimately we need to make students believe that they have learned All By Themselves- without any effort from the teacher, which was seen as a goal worth pursuing. These moments facilitate latent learning, where students engage, process and internalise information. The question is, how can we harness those moments and ‘sprinkle the magic learning dust on the others?